Description: Montage of back-alley underworld scenes. Comment: Before Brown broke into movie poster design, he was a mainstay for such magazines as Boy's Life. Pictures such as this showed well his story-telling abilities and were a hit both with the general public and with the art departments in the film industry. Condition	 Very good, matted not framed. 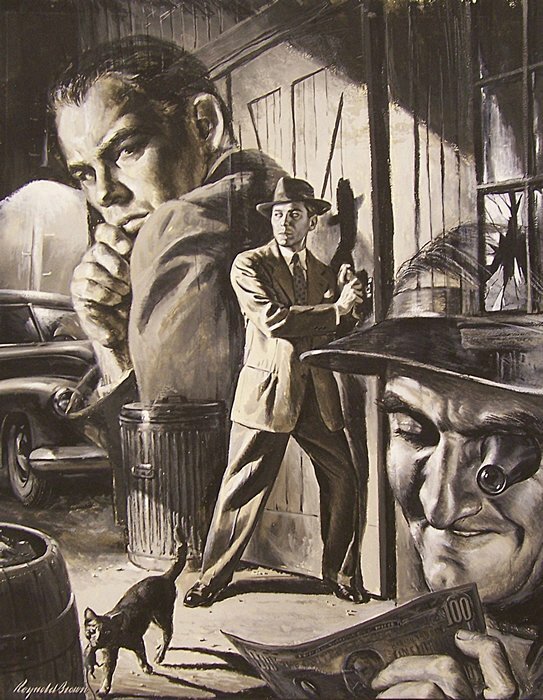 Publication Information	 Story illustration for “Master Counterfeiter” by Alan Hynd appearing in September 1949 issue of Boy's Life. Literature	 Reynold Brown: A Life in Pictures by Daniel Zimmer and David J. Hornung. Published by The Illustrated Press, 2009.